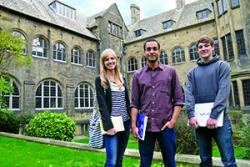 Bangor University continues to rise in popularity among its students. The University again leads the field in Wales and is placed 14th in the UK in a new university experience survey (Times Higher Education Student Experience Survey 2015). The survey, conducted by YouthSight for the Times Higher Education magazine, asked current students to rate their university experience according to several academic social and general measures, ranging from the educational content of their degree courses to include facilities and the general atmosphere and whether they’d recommend the university to a friend. Bangor’s ‘well-structured courses’ achieved the highest scores awarded. The University scored the second highest score for ‘helpful/ interested staff’, an excellent endorsement of the high standard of teaching and student care from the University’s lecturers. This is emphasised further by a further high score for the ‘good relationship with teaching staff’. The overall responses of Bangor University students reflected the high educational quality of the learning experience, and the support to such as a good library and good library opening hours, to underpin students’ academic experience at the University, while factors such as good security, accommodation, sports and general facilities all score highly. Bangor University students also appreciated the good environment around the University, the good social life and the good community atmosphere, scoring these highly. Vice-Chancellor Professor John G. Hughes said: “I am once again very pleased with this excellent performance which underlines the fantastic experience students have at Bangor University. This follows a remarkable year for Bangor which has also seen it ranked in the top 100 Universities in the world for its international outlook, and rated in the top 20 in the UK for student experience. Other recent successes for Bangor University include achieving excellent results in the Research Excellence Framework which recognised over three-quarters of Bangor’s research as being either “world-leading” or “internationally excellent”.